This extension integrates WordPoints with the BuddyPress social network plugin. A Points tab is added to member profiles, with sub-tabs for each points type. The number of points the user has, their rank, and the logs are displayed. This is visible both to them and to other users. 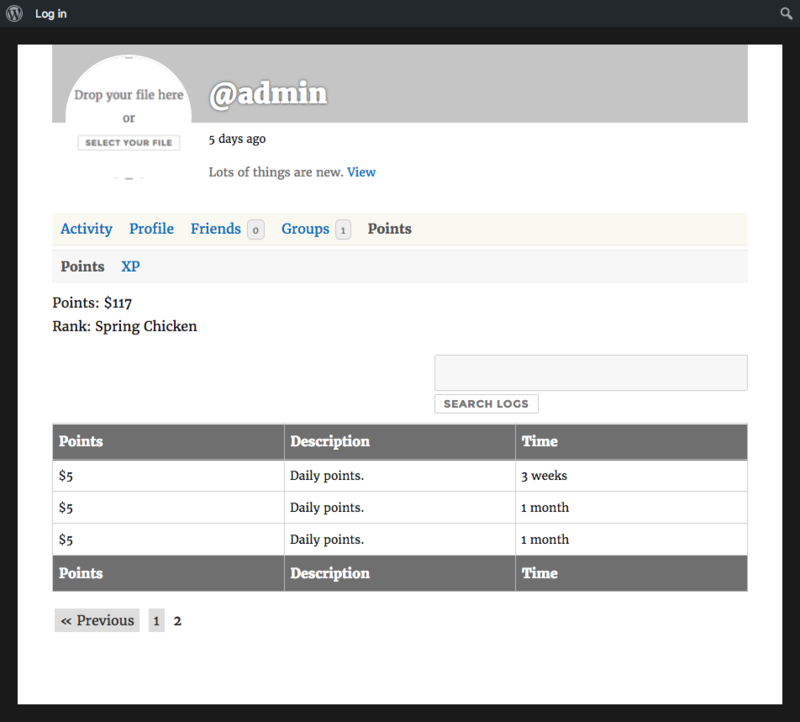 Usernames in the points logs and top uses tables are linked to the users’ profiles, so that clicking on a username will go to the profile of that user. Post Activity Update — When a member posts a status update. Can be used to award the activity author. Conditions can be set on the activity content and the author. Post Activity Comment — When a member comments on any item in the activity stream. Can be used to award the comment author, the user activity the activity relates to, or the author of the parent comment (if the comment is a reply). Conditions can be set on the comment content, or any of the involved users. Favorite Activity — When a member marks any item in the activity stream as a favorite. Can be used to award the user favoriting the activity, and/or the user the activity relates to. Conditions can also be set on either user. Accept Friendship — When a member accepts a friendship request from another member. Can be used to award both the initiator and/or the friend. Conditions can also be set on the friend and initiator. Request Friendship — When a member sends a friendship request to another member. Can be used to award both the initiator and/or the friend. Conditions can also be set on the friend and initiator. Create Group — When a member creates a new group. Can be used to award the group creator, or the creator of the parent group (if a child group). Conditions can be set on the group description, name, slug, status, creator, and those of the parent group (if a child group). Post Group Activity Update — When a member posts a status update from a group. Can be used to award the activity author, the group creator, and/or the parent group creator (if a child group). Conditions can be set on the activity content and author, and on the group and parent group attributes. Upload Group Profile Photo — When a member uploads a “profile” photo for a group. Can be used to award the user, the group creator, and/or the parent group creator (if a child group). Conditions can be set on the user and the group’s attributes. Set Group Cover Image — When a member sets the cover image for a group. Can be used to award the user, the group creator, and/or the parent group creator (if a child group). Conditions can be set on the user and the group’s attributes. Accept Group Invitation — When a member accepts an invitation to join a group. Can be used to award the user, the inviter, the group creator, or the parent group creator (if a child group). Conditions can be set on the user and group attributes. 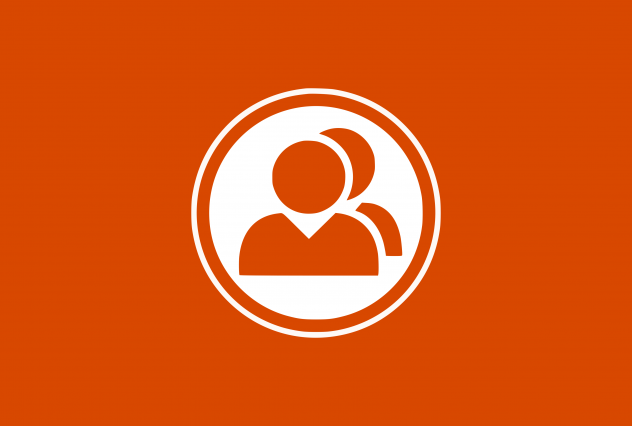 Send Group Invitation — When a member sends an invitation to join a group to another member. Can be used to award the user, the inviter, the group creator, or the parent group creator (if a child group). Conditions can be set on the user and group attributes. Promote Group Member to Admin — When a member of a group is promoted to be an Admin for the group. Can be used to award the user being promoted, the promoting user, the group creator, and/or the parent group creator (if a child group). Promote Group Member to Moderator — When a member of a group is promoted to be a Moderator for the group. Can be used to award the user being promoted, the promoting user, the group creator, and/or the parent group creator (if a child group). Accept Group Membership Request — When a member accepts the request of another user to become a member of a group. Can be used to award the requesting user, the accepting user, the group creator, and the parent group creator (if a child group). Conditions can be set on the user and group attributes. Send Group Membership Request — When a user sends a request to become a member of a group. Can be used to award the user, the group creator, and the parent group creator (if a child group). Conditions can be set on the user and group attributes. Join Group — When a member joins a group. Can be used to award points to the member, the group creator, and the creator of the parent group (if a child group). Conditions can be set on the user and the group attributes. Send Message — When a member sends a message to another member. Can be used to award the message sender. Conditions can be set on the message contents, subject, sender, and recipients. Set Profile Photo — When a member sets their profile photo. Set Profile Cover Image — When a member sets their profile cover image.